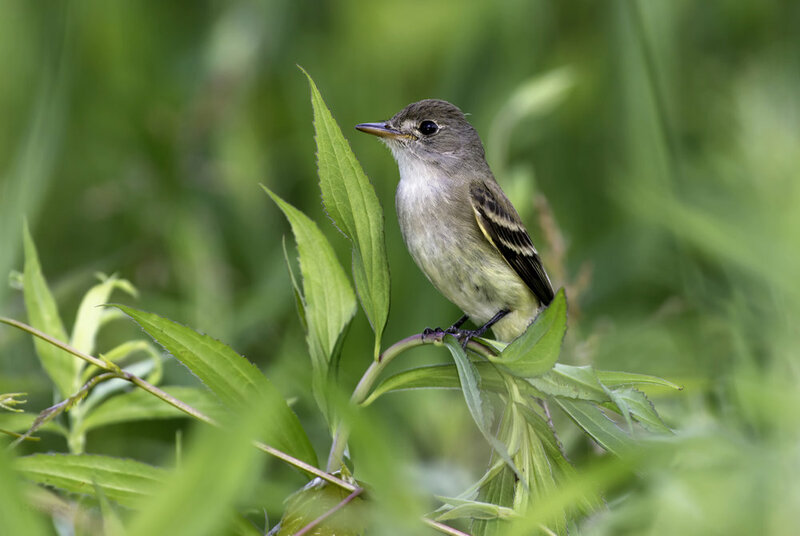 A diminutive bird, the Willow Flycatcher moves quickly through lowland shrub communities. The bird is brown or gray above with white to buff below. By sight alone, it's almost impossible to tell the willow flycatcher apart from similar species in its genus. However, its distinctive "fitz-bew" call separates it from the Alder Flycatcher. Willow Flycatchers prefer shrubby habitat with willows, elderberry, dogwoods, or honeysuckle. Their nests are crafted about ten feet off the ground, composed of swamp milkweed, cattails, cottonwood down, and grasses. These flycatchers breed mostly in southern Wisconsin, according to the Breeding Bird Atlas, but have been recorded into the far northern reaches of the state. You can see these birds down Prairie Lane, in the shrubby areas of the Crawfish River floodplain.